While there are several online articles that should be enough to allow anyone to set up their cantilevers with good results (e.g. Sheldon Brown), one intelligent cyclist has taken it a step further and produced an article outlining how the cantilever brake works (Cantilever Brake Geometry by Benno Bulhumeur). One of the clearest results, and often the easiest adjustment to make, is that lowering the cable yolk always increases mechanical advantage. While this may not be possible with the later cantilever designs utilizing a cable splitter instead of a yolk it is true for pretty much every cantilever brake made prior to 1990. This simple adjustment jives with my experience and I always set-up cross bikes so that yolk is just above the bolt hole in the stay bridge or fork crown. Often it pays to install fenders first and then make the final adjustment to the yolk height. Sometimes cantilever brakes can have too much mechanical advantage. These are the brakes that feel really spongy and have too much lever throw. 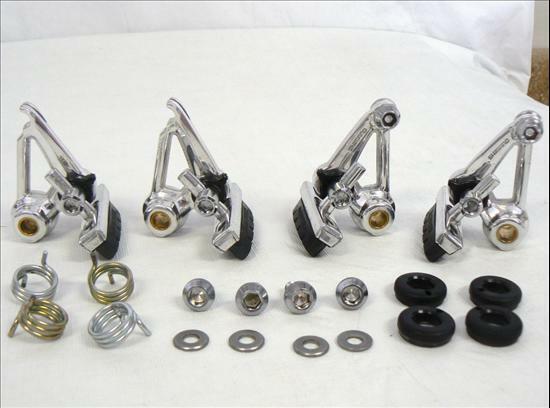 This is usually related to poor lever and brake pairing, but it can also be the brake set-up. The article points out that the oft sighted rule of thumb of having a 90 degree angle between the straddle wire and the lever arm of the brake is not only flawed, but can be totally inappropriate for some brakes such as low profile brakes mostly used in the 1990s on mountain bikes. I believe, that low profile cantilevers are the reason many mechanics have frustrations with them. If you play with the yolk height for the low profile cantilever on the interactive cantilever set-up calculator you will see that mechanical advantage decreases rapidly as you increase yolk height. While the brake arm is static, keep in mind that the power is also related to arm position and as the pads wear the arm can become dangerously close to parallel with the braking surface in which case you loose a lot of power. For this reason the brakes should be set-up with the pad as far inboard on it’s mount as is feasible (i.e. arm is further out). This article and the interactive calculator should be able to help anyone better understand cantilever set-up and can help you choose the type of brake that is best for you. It nicely displays why the early Shimano Deore XT cantilever was one of the best. It was a medium profile design and had a fool proof set-up. Enjoy!